Your cheesecake looks perfect! Great idea to combine gingersnaps and cranberries. YUM! Happy New Year! Your cheesecake came out tall and creamy! I halved the recipe but mine doesn’t look anything like yours! Beautiful! Gingersnap and Cranberry must have been divine- I can almost taste it. I love your comment about wanting to luxuriate in a water bath- ha! When I read the last sentence of your first paragraph, I almost spit out my coffee laughing. Gingersnap and cranberry sounds really great – and yeah, who has time to luxuriate in a water bath?! This looks fabulous! The gingersnap crust and cranberry sauce sound delicious. That’s one gorgeous cheesecake! Glad you enjoyed it! I got a great giggle out of the water bath instruction too. It just made me love the recipe even more! Your cheesecake looks and sounds great!! Sigh… and to think that after all this flattery I’ve been pulling on you, I was hopping to get an invitation for dessert sometimes! LOL …kidding, of course! But not to say I wouldn’t jump on the occasion… wow, especially for that amazingly beautiful cheesecake! “Eating as much as possible” was your plan, too? This looks fantastic. The gingersnap crust and the cranberry sauce? Inspired. Oh my. That slice is most enticing. Lovely! I love the big slice photo! I wish I could have it! Beautiful! I should have thought of the cranberry….darn! Totally – I watched mine “luxuriate” and had to suppress feelings of jealousy 🙂 And I’m a fan of your holiday eating plan, it sounds quite a bit like mine. Beautiful cheesecake! What a perfect holiday cheesecake. You are right cranberries aren’t just for Thanksgiving! Beautiful. Love the cranberries idea. Happy New Year! Ooh, yum! I would never have thought to top it with cranberry sauce. What a great idea! Your choice of cranberry topping and gingersnap crust certainly fits the season. Great work! Gingersnap crust sounds divine great idea I am writing that down… Your cake looks great good job! That looks sooooo divine. Im hungry now. Mouth watering. Happy New Year, and all the best. Gorgeous as always. Cranberry sauce sounds perfect with this!! I love the homemade cranberry sauce. YUM! And a beautiful cheesecake too! I think the cranberries must give the cake a perfect balance of sweet/creamy and sweet/tangy. I want a slice!!! Please!!! Happy New Year! I look forward to reading more of your cooking adventures in the new year!! I love your flavor combo and and and your looks very tasty. Beautiful photo. Glad you liked it too. Oh, that is looking pretty fabulous! My photos just stunk on this one, but yours looks as good as it seems to have tasted. 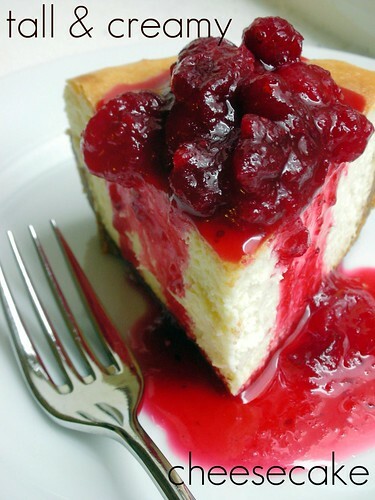 Your cherry topped cheesecake looks great! I loved Dorie’s luxuriate instruction. Katie– To make the cranberry sauce, I just used the recipe off the bag of Ocean Spray cranberries…same thing I use for Thanksgiving dinner! I resolve not to visit this blog often because of fear of putting on more weight! OMG! Look at that cheesecake! Looks wonderful. You can’t beat cheesecake for dessert in my opinion. I’ve become a cheesecake lover. This one looks great. Luxuriating in the water bath, I agree with you, I’d love to do that! Just catching up a bit…your cheesecake is absolutely stunning and gorgeous! Wow. YUM! I am catching up on blog posts and this looks incredible, but I am not surprised. Everything you blog about looks incredible. Happy 2009!